Offering stunning scenery, golden beaches and ancient cities, central Italy is hard to beat as a holiday destination. The rich landscape of Tuscany has an enduring appeal for holidaymakers of all ages who come in droves to enjoy the region’s cuisine, culture and beauty, as well as the beautiful cities of Florence and Pisa. 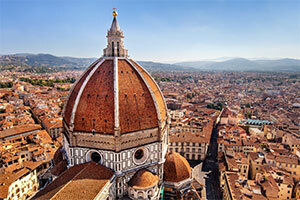 Our Tuscan campsites are well placed for exploring all that this fantastic region has to offer. Florence Florence is packed with treasures. The skyline is dominated by the Cathedral (the Duomo): climb up inside the huge dome to view the frescoes and on to the lantern for the fabulous view of the city. Right next door is the Baptistery with its spectacular mosaics and ‘Gates of Paradise’ doors. Be sure not to miss Michelangelo’s David in the Galleria dell' Accademia. Pisa At the edge of medieval Pisa is the Campo dei Miracoli – the Field of Miracles - where you’ll find not only the Leaning Tower but also the superb cathedral, the baptistery and the Monumental Churchyard, said to be built on earth brought back from the Crusades. Siena Amazing as it is, Siena’s ornate gothic cathedral is just part of what was planned – the half-built Duomo Nuovo is testimony to the Black Death that brought building to an abrupt halt. Be sure not to miss the frescoes and books in the Biblioteca Piccolomini. A more unusual attraction is the relics of St Catherine displayed in the Basilica of San Domenico. To find your perfect campsite in Tuscany please use our interactive site finder, call our knowledgeable customer advice team on 01 242 1901, or go straight to the individual campsite pages.